So let’s say you’re driving up the 101 from your tech corridor job, heading back to your city neighborhood, and you just can’t take another moment of traffic. Enter Burlingame, the quaintest of the suburban trail of towns that dot the Peninsula from San Francisco to San Jose, and an easy stop off Peninsula Avenue or Broadway Ave. If you’re traveling by train, simply hop off at the terra-cotta main train station on Burlingame Avenue. Burlingame Avenue is the pulse point for this darling little town, which serves its own residents and the local hillside town of Hillsborough. In recent years, Burlingame Avenue has become a mecca for restauranteurs, and new and delicious spots are popping up monthly. Happy hour is the best way to get acquainted with these dining delights, when many restauranteurs offer half-price drinks and much-discounted eatery fare. Happy hour soothes the soul in a way nothing else can. The light is still golden, the afternoon is still filled with the promise of relaxation, and the night, not yet descended, still seems hours away. So pull up a stool in Burlingame, and get ready for some easy-on-the-soul, inexpensive cocktails and fine cuisine in a town so cute you’ll think you’ve landed in Carmel’s sister city. 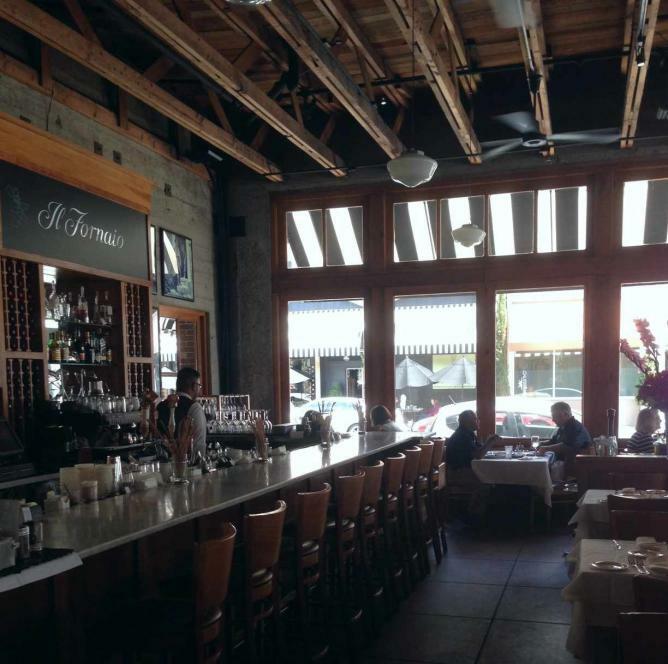 Zambra is a lovable tapas and full entrée restaurant, located just off Lorton street, a few steps off the base of Burlingame Avenue. Happy hour is a good four hours long—meaning you don’t have to rush to get there after work—and lasts from 3 to 7pm every day of the week. Drink fare is about $6 a pop and a full happy hour offers tapas at about $5 per item, including fried calamari, Spanish patatas, ceviche, and much more. Their entrées—should you decide to stay for dinner—are delicious, well priced and inventive. Try the oven roasted rockfish, salmon a la plancha, or the paella—a knockout dish perfectly prepared and perfectly placed on the spice pallet. The meat dishes are delectable, and the lamb chops in particular are just divine. But the real draw here is the friendly, open vibe of the place—sweet, efficient bartenders and a warm owner and staff make Zambra the best pick for a weekday or weekend happy hour haunt. A couple of blocks up from the train station and just off Burlingame Avenue on Primrose, Barracuda sports a full bar and a handful of terrific happy hour foodie delights in its Japanese Restaurant. The sushi here could not be fresher, and the restaurant is reputed throughout the Peninsula for its beautiful sashimi and sushi. Pull up a chair at the long bar and order up $3 hot sake and $3 beers, then settle in for a couple of full $4 California rolls, $3.50 pork gyoza, $4.50 tempura, and $4 chicken yakitori skewers. This is the best Japanese food deal around—two happy hour celebrators can have a great meal, sake and beer and get out for under $30. The décor is a bit of a mashup between southwest and Asian—but the restaurant is roomy and open and has a terrific, casual feel. The height of upscale Mexican cuisine, this newfound gem is the perfect place to sip Margarita concoctions and sample exquisite south-of-the-border fusion fare. Draft and bottled beer, wines by the glass, and well drinks are all half-price at happy hour, and their La Avenida margarita is priced at $5 a glass, $12 a half-bottle, and $20 a bottle. For five bucks, diners can get house-made guacamole with roasted poblano jalapeños and chips, queso fundido dip with sautéed peppers and chorizo, nachos, a 2-taco plate, or spicy calamari with chili pepper rings. The room is open and airy, and bustling with good cheer—the perfect place to while away an early afternoon. Though Blue Line Pizza is truly all over the place in the suburban landscape of the Bay Area, the draw here is the ambience and the locale. Set in a long, hardwood-floored room with an extended bar, the restaurant opens up into a back patio where filtered light fills the afternoons with a lovely outdoor vibe. The feel is as if you’re dining in an urban park—an open-air, hip, citified, and coolly casual patio scene. Blue Line offers half off any appetizer—think: spicy chicken wings, roasted peppers or spicy meatballs—and $2 off wine and beer. The pizza here is truly something to write home about. Choose deep dish or thin crust; either way you won’t be disappointed by Blue Line’s mashup of fine flavors.